Homeowners in Severn, Maryland are constantly debating whether to install a vinyl or wooden privacy fence for their pristine homes. Every privacy fencing option will have pros and cons, and it is important for a homeowner to work with a trusted professional who can explain all of the available options. Let’s took a look at the pros and cons of each material. Let’s start off on a positive note. Wooden fences are available in a wide variety of stlyles, and this allows homeowners a lot more options when deciding on a privacy fence to compliment their Severn home. Wood privacy fences are also cheaper than vinyl privacy fences, but you aren’t sacrificing quality with the cheaper price tag. Curb appeal comes down to opinion, but a wooden privacy fence offers a classic look. The downside, of course, is that wooden fences require regular maintenance to keep an aesthetic appeal. 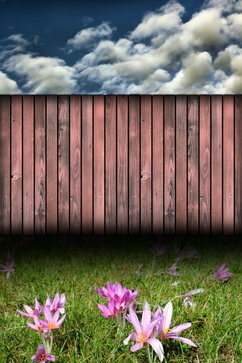 Staining, painting and preventing bug damage is required to make sure a wooden privacy fence keeps its luster. A wooden privacy fence is great for someone on a budget, but make sure you realize the costs of properly maintaining your fence after it is installed. I’m a fan of minimal maintenance, and a huge draw of vinyl privacy fencing is the fact that you only need an occasional cleaning to keep a vinyl fence in tip-top shape. Because of the material, vinyl privacy fences do a better job at handling the elements and are known for a long life span. While your neighbor is trying to get rid of the terminate infestation in his wooden privacy fence, you can just kick back and enjoy your day! The drawback of a vinyl privacy fence, however, is the fact that you will pay more upfront than you would for a wooden fence. For a first time homebuyer, the price tag can appear a little daunting. Each options are great, but working with a professionals will help you get the most bang for your buck! If you live in Severn and are ready for a beautiful and cost-effective fence, you are in the market for composite deck installation. Freedom Fence and Home has lots of experience with privacy fencing, and is available in the Severn area to install a customized fence to suit your needs. . If you have any questions about Privacy Fencing, please contact Freedom Fence and Home by calling 443-271-6841 or visit our website. You can also follow us on Facebook and Twitter! This entry was posted on Friday, June 19th, 2015	at 6:13 pm	. Both comments and pings are currently closed.